Ford Library would like to invite you to attend the inaugural Duke India Business Forum, which is being held on Sunday, March 22nd at the Fuqua School of Business. Below please find just some of the new, exciting titles that Ford Library has on India and business. Please browse the library for even more choices. Click on the titles to place a hold or check availability. Schroeder, Alice. The snowball : Warren Buffett and the business of life. Bantam Books, 2008. Alice Schroeder’s published research on Berkshire Hathaway so impressed Warren Buffett that he offered her unprecedented access to his files and himself. The resulting biography is a detailed chronology of not just his business strategies but also his personal life. Frugal to a fault, Buffett lives modestly and takes a mere six-figure salary from Berkshire Hathaway. His disciplined habit of investing for the long term has garnered him a sizable fortune. While his investing strategies are well known, his ideas on philanthropy have not been as widely disseminated. Criticized for not giving away more of his enormous personal fortune, Buffett’s multiple reasons for not doing so are explained in one of the more interesting sections of the book. Responding to critics aghast that he wasn’t leaving the bulk of his money to his children, he responded that trust funds were “a lifetime supply of food stamps” and doing so was a “harmful and antisocial act”. Buffett didn’t give much money to charity until very recently because he wanted to allow what money he had to grow more quickly by compounding over time. Schroeder writes clearly and Buffett fans will enjoy the book’s level of detail, but this biography is overlong at nearly one thousand pages. © Reviewer: Paula Robinson & Ford Library – Fuqua School of Business. All rights reserved. Janes, Dominic. Ed. 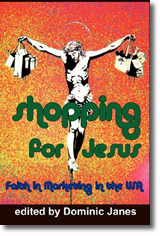 Shopping for Jesus : faith in marketing in the USA. New Academia Publishing, 2008. There is a thin line between attraction and revulsion. It is like cleaning the refrigerator and finding food of unknown vintage. Despite knowing it is spoiled, there is a compelling urge to open the container and take a sniff before throwing it in the trash. When I saw this book on the display shelves in the marketing area of the Ford Library, I noticed the crucified Jesus on the cover, his outstretched hands nailed to the cross, clutching shopping bags filled with consumer goods. I was repulsed by the cover, yet I could not resist the urge to open it up and sniff the contents. What I found surprised me. Shopping for Jesus is a collection of thoughtful essays about the boundary between religion and business. It explores the connections between belief, its presentation and the processes by which it is sold and consumed. Each chapter presents an independent case study. The Economist Intelligence Unit has changed our Duke portal without notice, affecting how remote users access the site. After an off-campus user clicks the link to the Economist Intelligence Unit, and logs in with their Duke NetID and password, they will be presented with a new “front page” for access to our Duke portal. Click the “Enterprise Client login” link to complete your connection to our Duke EIU portal. Show me this. Please note that our subscribed coverage to The Economist Magazine web site (economist.com) has been omitted from the new portal. The full text + graphics of Economist articles is temporarily only available to on-campus users who can still connect to the old version of our Duke EIU portal. Off-campus users can still access the full text (without graphics and text boxes) of Economist articles in the new portal. We are working with EIU to restore a seamless login to our Duke EIU portal, and to restore our subscribed access to The Economist Magazine web site via the portal. If you have any problems accessing EIU content, please feel free to contact us. Lauer, Chris. The management gurus : lessons from the best management books of all time. Portfolio, 2008. The senior editor of Soundview Executive Book Summaries compiled 10 to 20 page summaries from 15 management books, half of which were best-sellers in their time. Every valuable book does not become a best seller, yet this reviewer would argue that the books selected for this volume are not the best management books of all time. For example, Topgrading, a book about filling every position in an organization with an A-Player, is not A-list material. And it is odd that the best management books of all time would be largely written since 2005. The author-gurus included in this volume are well respected writers, educators, executive coaches and consultants. It is interesting to see what authors were selected as “management gurus” and even more interesting to see what authors were not. Charles Handy, Warren Bennis and Don Tapscott are included. Peter Drucker, Michael Porter, Rosabeth Moss Kanter and Tom Peters are not. Surely any serious book on management thinking would include the latter set. Dealing with Darwin : how great companies innovate at every phase of their evolution by Geoffrey A. Moore. The Next Global Stage : challenges and opportunities in our borderless world by Kenichi Ohmae. True North: discover your authentic leadership by Bill George. Small Giants: companies that choose to be great instead of big by Bo Burlingham.